“…Paris with the snow falling. Paris with the big charcoal braziers outside the cafes, glowing red. At the cafe tables, men huddled, their coat collars turned up, while they finger glasses of grog Americain and the newsboys shout the evening papers. The buses rumble like green juggernauts through the snow that sifts down in the dusk. White house walls rise through the dusky snow. Snow is never more beautiful than in the city. It is wonderful in Paris to stand on a bridge across the Seine looking up through the softly curtaining snow past the grey bulk of the Louvre, up the river spanned by many bridges and bordered by the grey houses of old Paris to where Notre Dame squats in the dusk. 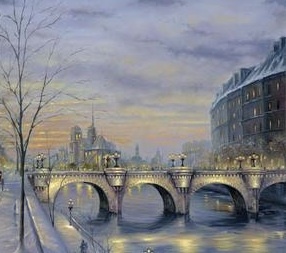 It is very beautiful in Paris…at Christmas time. Editor’s Note: Ernest Hemingway wrote “Christmas at the Roof of the World” in 1923, when he was living in Paris and working as a correspondent for the Toronto Star. Find the story in BY-LINE ERNEST HEMINGWAY: Selected Articles and Dispatches of Four Decades, available at Amazon.com.